This blade has been worked into a very unique shape and it's perfect for slicing sashimi. 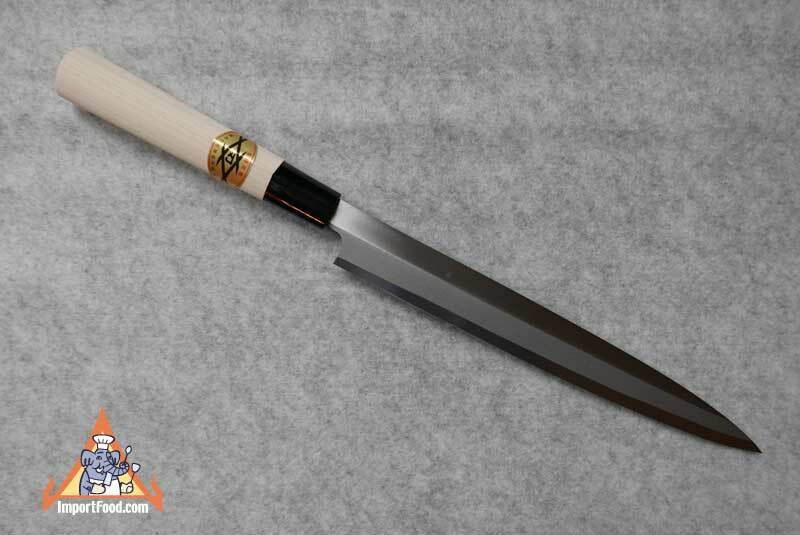 It is sharpened on one side only, suitable for right-handed chefs. You can also see a similar knife in action in our video of a sashimi master at the Tokyo fish market. Why not own a knife like this in your kitchen? It really doesn't get any better. Using knives this sharp enhances not just your experience in the kitchen but also the food, because slicing with an inferior knife tears into and rips fibers. A sharp blade keeps like this won't tear the fibers of your fish, keeping flavors sealed in. You're also supporting the remaining hand crafted knife makers in Japan, reported to be dwinding to just a few hundred, as fewer young people are coming into the trade. Our sashimi knife shown here is made by hand in the same factory as shown in our video series. We personally visited and met the lead sharpener who has trained with the master for four years. The knife is made of hard carbon steel, sharpened on one side only (for best performance slicing fish). The handle is 'magnolia' but this is a really a relatively soft poplar grown in Japan. As you can see, there is a hard black plastic band at one end of the handle. The blade is 11.5" long, and handle is a bit less than 6.5" long. Total length is nearly 18". Each unique knife is totally made by hand and we only two these, so order now if you'd like to have it.